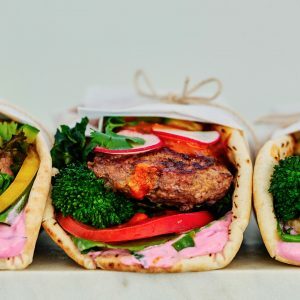 Skip the food truck with these Madras Curry Lamb Burger Gyros and you’ll be happy you did… This flavor bomb will blow your mind in the best way possible, and you’ll want to put this curry on everything you make! In a large bowl, mix your lamb, shallot, garlic, and ½ cup of the curry. Set aside at room temperature for 30 minutes. Cut your cactus pears in half lengthwise. Scoop out the inside into a blender or food processor. Pulse until juices are released. Strain the contents into a bowl to remove the seeds. Mix in the yogurt and 3 tbsp chopped cilantro leaves. Set aside. Add your broccoli rabe to a baking sheet. Lightly drizzle with avocado oil, and season with salt and pepper. Cook for 10 minutes. Set aside. Split your lamb mixture into 4 parts. Form your patties in an oval such that they are the length of your pita breads. Heat your cast iron over medium heat. Cook your patties 4 minutes on the first side, and an additional 2 minutes on the second side. 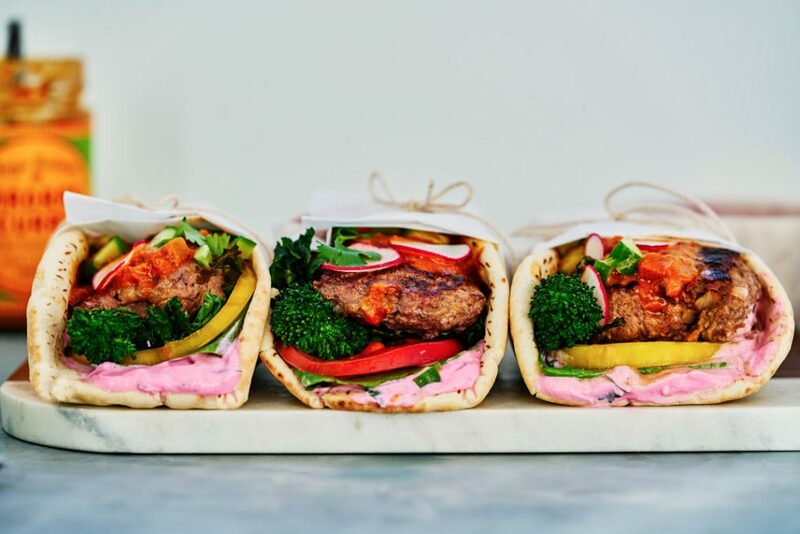 To assemble your burgers, gently heat your pita breads over an open flame, in a toaster, or in the cooling oven. 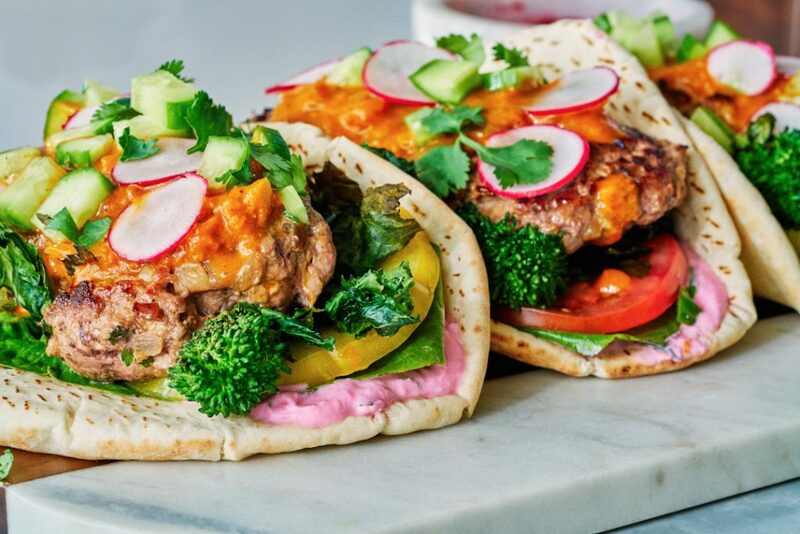 Spread a layer of the cactus pear yogurt on your pita, top with a piece of lettuce, 2-3 slices of tomato, 2 stems of broccoli rabe, a burger patty, a few tablespoons of the Madras curry, ½ of a diced cucumber, ½ a sliced radish, and a sprinkle of cilantro. Wrap in parchment paper for less-messy eating! First, make the cactus pear juice 1 day in advance. Refrigerate in a sealed container. Then, mix with the yogurt just before serving. Then, the meat mixture can be made hours in advance. Refrigerate until 30 minutes before use. Finally, make extra cactus pear juice! It’s delicious on it’s own or with tequila. Next, buy your favorite salsa instead of chopping up the tomatoes, cucumbers, & radishes. 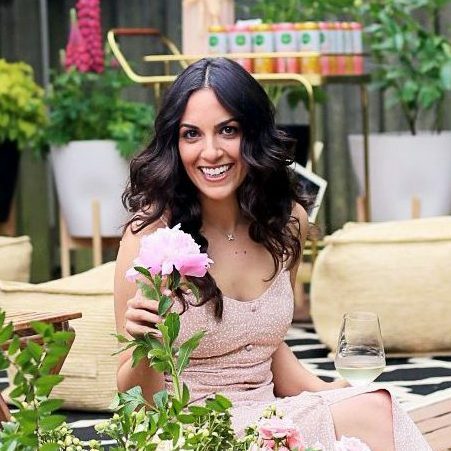 Can’t find pita? Then use hamburger buns or flatbreads. What curry do I use? 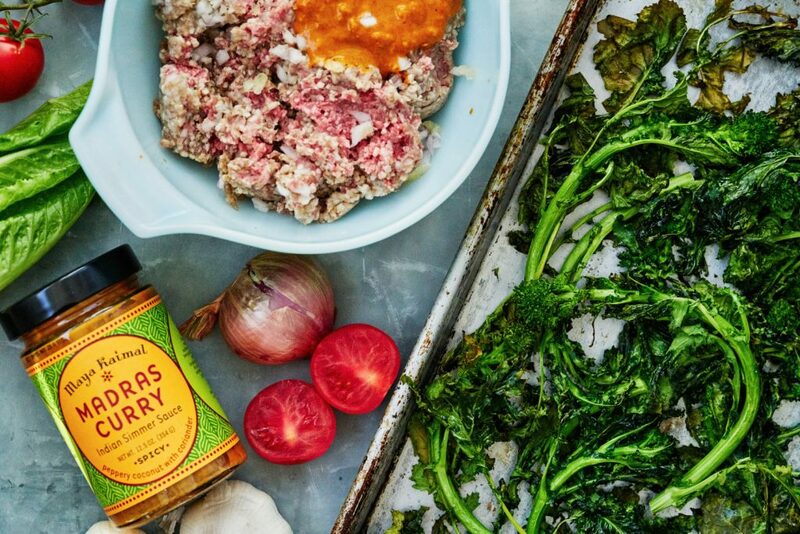 Click here to purchase the Madras Curry Sauce I use in these lamb curry burger gyros. Many store bought curries tend to be salty…this one isn’t. 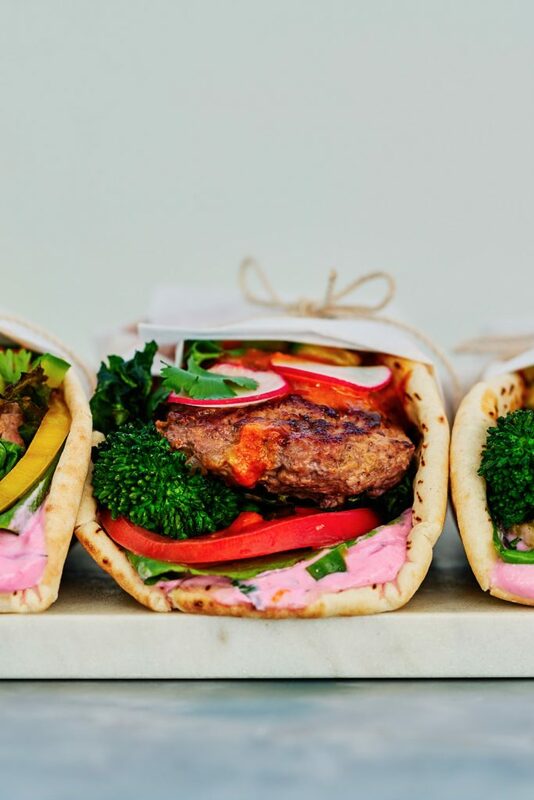 Let everyone build their own gyro! Then, they get to pick their own toppings and everyone is happy. Serve all the chopped veggies right off the cutting board. Just segregate the vegetables and add some utensils for serving. As a result, less dishes and easier clean up. Broccoli rabe a.k.a. rapini is dense with nutrients. The fiber & water in this vegetable keeps you full longer (helping with weight loss & food intake), & aids in digestion. Also, it’s loaded with vitamins and minerals like A, C, K, calcium, folate, & iron. It’s a health nut’s dream! Looking for more ways to incorporate broccoli rabe into your diet? Finally, here are some other recipes that use broccoli rabe. I love incorporating broccoli rabe into dishes that aren’t the healthiest. It’s a healthy boost to my favorite foods. 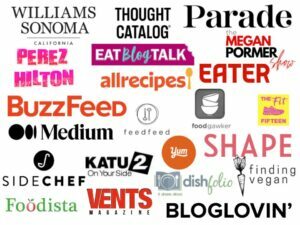 No more guilt here! This shop has been compensated by Maya Kaimal Fine India Foods and D’Arrigo Bros Co. All opinions are mine alone.